Discipline the mind, surrender to your soul, and create your life flow. 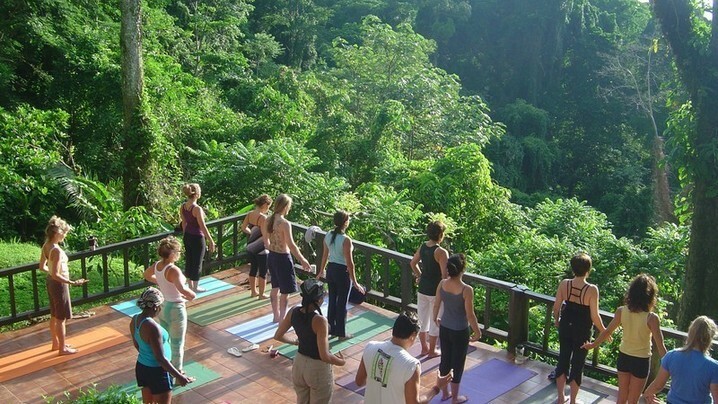 Nurture yourself on this journey of self-healing through yoga, meditation and breath work. There will be plenty of free time available for everyone embark on adventures and exploration. I will also be available for additional private yoga sessions, Reiki and Shamanic healing bookings at a discounted rate. Round-trip transportation to and from San Jose International Airport (SJO) is included on the first and last day of the trip. It takes more than 4 hours to get to the venue from the airport. My name is Angela and I am looking forward to joining you on a journey in which we all come together as a community and embark on a path to self-enhancement and well-being. TripTribe is a beautiful platform that we can all use to bring us together as a group at various beautiful locations around the world. 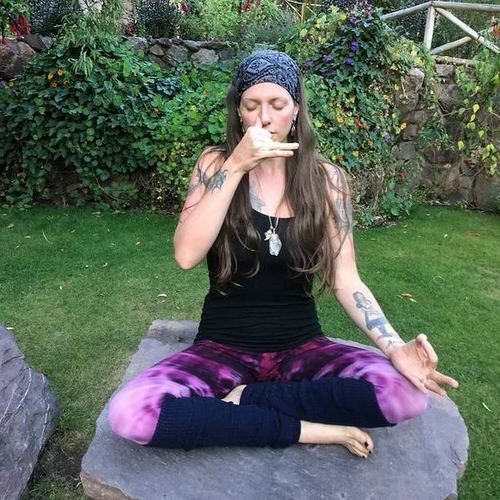 On your trip I will help guide you to create a safe and open space within yourself for you to heal and grow from the past, present, or future stress that is carried within ourselves by learning how to relax, release, and recharge. I am pursuing a path in Holistic Healing with my passions focused in Reiki/Shamanism, healing through art, and yoga. It is not my intention to be the healer, I only wish to serve as a guide for those that are ready to heal themselves; to provide insight, tools, practices, and exercises that facilitate the healing process. We all have the ability to heal ourselves, but sometimes we get stuck inside our own heads with circular thoughts and end up creating our own limitations. As many of us know, the path to healing is not always the easiest path and at times we may have to truly face ourselves and some of our deepest darkest parts, but it is by embracing all the parts of us that we can become whole. We are all teachers and students to one another......the ebbs and flows of that relationship is where our growth and personal evolution take flight. I am ready for our adventure. The jungle is the perfect therapy for guests who need to unplug and unwind – we thought it was just us but research has proven it to be true. 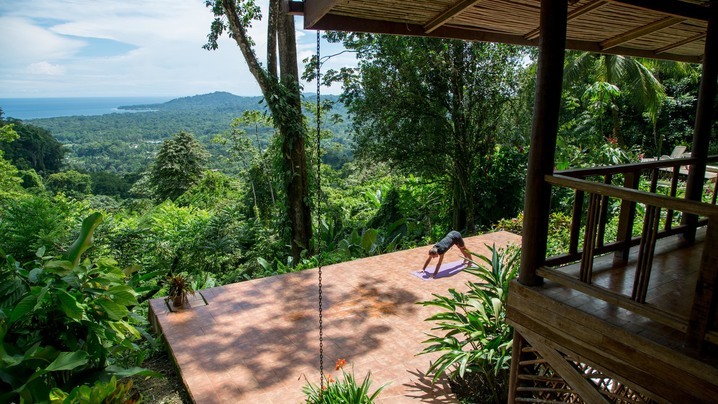 Our yoga and wellness retreat is located along the Caribbean coast of Costa Rica, set in a 250 Acre Primary Rainforest Reserve overlooking a mountain range and the Caribbean Sea. The views are beautiful, the vibe peaceful and the experience serene. It is the perfect place to retreat, relax, rejuvenate and re-energize to tackle the next phase of life’s adventure. Our Sanctuary is ideal for our guests to retreat, relax and rejuvenate so they can tackle the next phase of life’s adventure. We thought it was just us but research has proven that our environment is the perfect therapy for our guests who need to unplug and unwind. Being here automatically improves mood, lowers stress, elevates the body’s feel good hormones and it’s healing properties. In fact post-operative patients have been shown to physically heal faster around nature. We are also just a 20 minute drive away from beaches, snorkeling and surfing as well as dining and nightlife in the Caribbean town of Puerto Viejo. This town is bustling with energy and local culture yet untouched by modern commercial development. Nothing wrong with this of course, but if you are looking for a more authentic experience, it is in this region that you will find it. 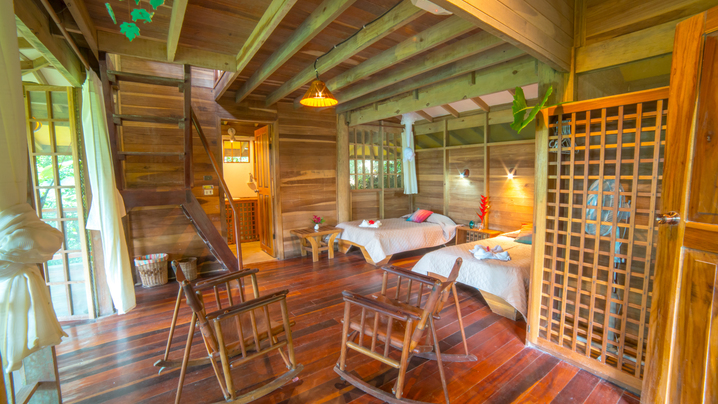 - Ten Caribbean style bungalows that can sleep 2 to 5 people each secluded in its own private area with private bathrooms, a sitting area and private balconies overlooking the Rainforest, the Caribbean Sea or both. - A dormitory style guest house with 6 rooms with a shared balcony and shared female / male bathrooms. The Samasati Spa offers relief and rejuvenation with treatments rooted in nature by capturing the healing powers of plants and preserving village remedies. Choosing all-natural super food ingredients from the Caribbean, we use flowers, leaves, bark, roots, seeds and fruits of indigenous, naturally cultivated plants. The products are then artfully combined to provide a wide range of authentic beauty and wellness rituals. Our menu is served by highly sought after international Guest Therapists and gifted local practitioners. These experts combine local plants and fruits to provide nutrient-rich living food for your skin. Cucumbers are sliced to create hydrating eye masks, local salt crystals are blended with virgin coconut oil for body scrubs, local cacao is grated, Aloe Vera is squeezed, juices are pressed and raw chocolate warmed for deeply nourishing body masks. 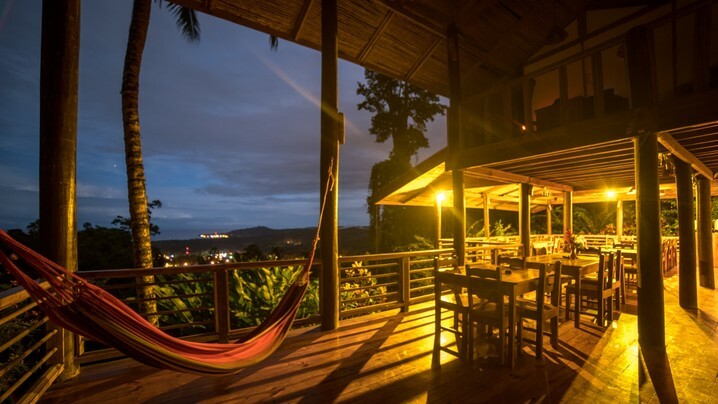 Our open air restaurant sits in the mountain overlooking the Rainforest and Caribbean Sea providing dramatic views and a unique dining experience. Breakfast, lunch and dinner are served with selections ranging from Caribbean fusion, to Mediterranean to Asian to Central American. Most of our cuisine is vegetarian but chicken and fish delicacies are available if you so choose. Seafood is drawn daily from sea, while fruit, vegetables, dairy and poultry are sourced from local farmers or picked on site. The breads are baked daily, chocolate comes from nearby organic cacao plantations and the staff will happily accommodate requests made in advance for raw, vegan, gluten free, dairy free or soy free dishes. Don’t forget to leave a little room because every evening ends with an indulgent dessert! We also have a specialty bar that serves unique coffee, tea, wine, beer and fresh cold-pressed juices. Stand alone large family style vacation homes with full kitchens, full bathrooms, private bedrooms, porch or verandas and living rooms. 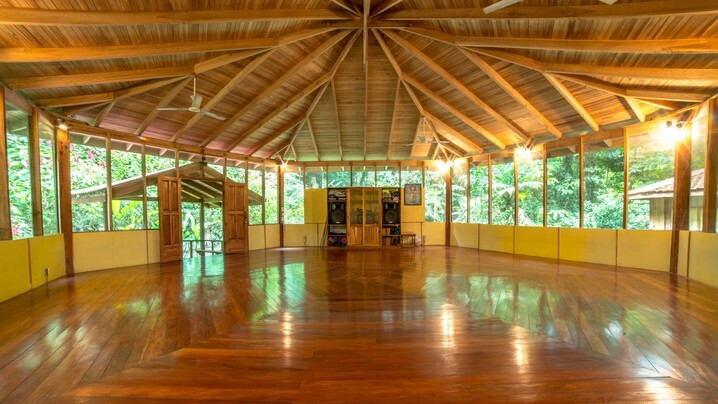 These Casa Grandes are still within walking distance of the restaurant and lounge and yoga/meditation studios. Each Casa Grande sleeps 5 - 6 guests each. 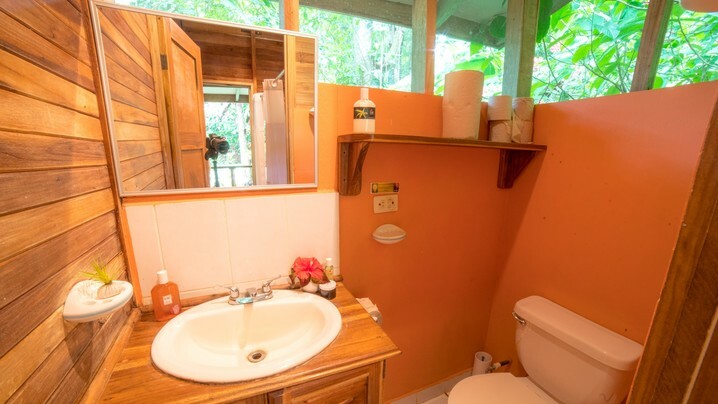 All casitas have private bathrooms, and a spacious veranda overlooking the rainforest and Caribbean Sea. All our casitas have comfortable two single beds or a Queen bed and some have a third double bed in a loft. The Guest House is situated a short walk from the restaurant and reception area. It consists of 5 adjoining private rooms with two shared bathrooms, one for men and another for women. Choose from rooms with either two Single beds or one Double bed. This Guest House is a great option for solo travelers or groups of friends looking for cozy and inexpensive accommodations. We also have a house with 4 bedrooms and 2 bathrooms and a shared kitchen and living room. With a balcony overlooking the mountain and Caribbean sea. The rates will be for each of these rooms. 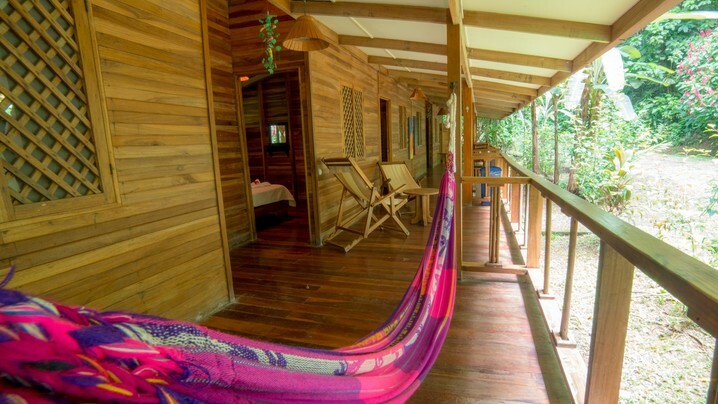 These Casitas have windows that open to prime views of the Rainforest or the Caribbean Sea. 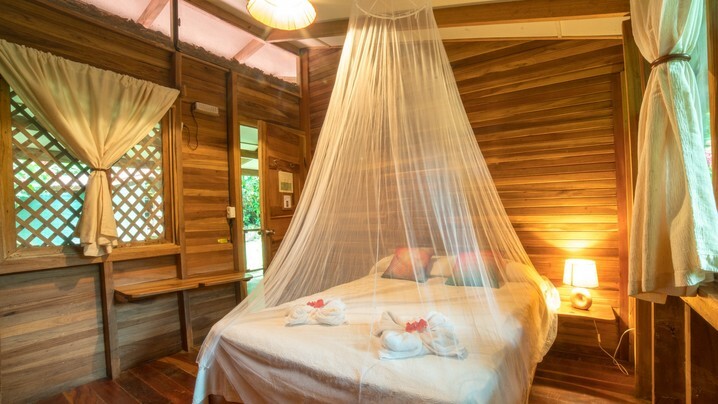 Each of them is in it’s own secluded area in the forest and has a King bed, a private bathroom, a quiet terrace with a hammock and is set in a little tropical garden with local flora. 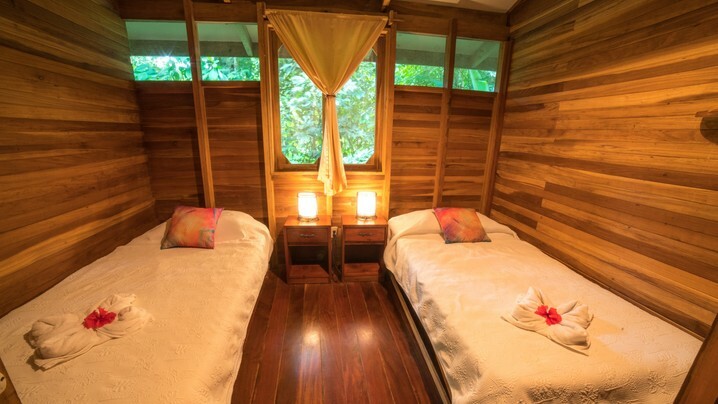 These Casitas are ideal for couples. Join Angela's Tribe and stay up to date on their trip!